Decided to deviate from the normal spaghetti and meatballs and opted for Fettuccine and meatballs instead. Fettuccine according to family size, cooked according to instructions. Drained, do not rinse, add 2 TB butter, freshly chopped parsley. Make this last. 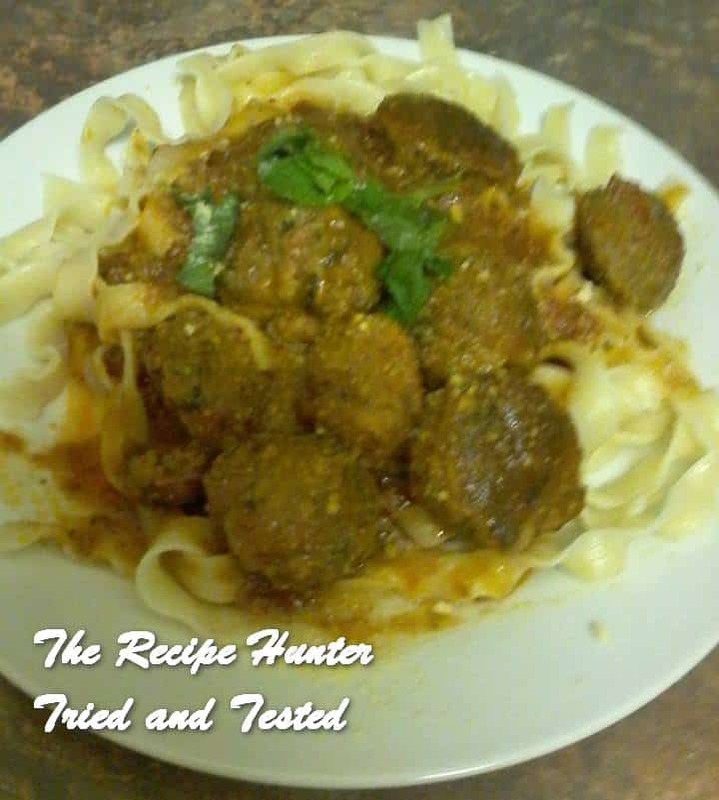 Mix all together (don’t over mix) and form meatballs and refrigerate while you make your sauce. Line a baking tray with foil. Spray with olive oil cooking spray and add your meatballs. Bake for about 20 minutes until about 70% cooked – you don’t want them to dry out and they will still cook in the sauce. Meanwhile, make the sauce. Heat enough olive oil to coat the bottom of a medium size sauce pan (I used my wok). Add onions and fry till just soft, add garlic and fry 30 seconds, add the rest of the ingredients and bring to a boil then immediately turn to low and leave on gentle simmer. Taste and adjust seasoning if necessary and add your meatballs.